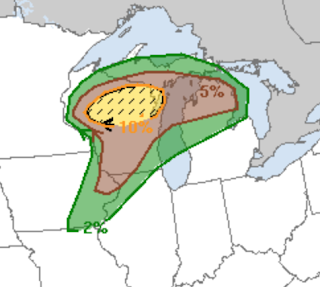 Because it is out of season I want to let you know there is a serious risk of violent tornadoes in parts of the Great Lakes region. The brown is where there is a significant risk. The yellow is an enhanced risk and the hatching means violent tornadoes are forecast. This includes Chippewa Falls, Green Bay, Rhinelander, and Wausau. If you live in this region, please keep an eye on the weather as the day progresses.